This is a very short essay that was written after Chimamanda’ s hugely successful TED talk on feminism. I haven’t seen the talk, but I have recently heard a number of good things about it, so it went on my to-read pile. It is only about 50 pages long and it seriously took me about half an hour to read before bed – it was very good food for thought! Picking it up as an eBook for 99p for my kindle I couldn’t really complain. It was what I felt in the mood for and it is very rare I read on my kindle now but I wanted to read it, and I wanted to read it now! I’m really glad I succumbed to the desire because I really enjoyed this. This is by no means an extensive text on the theory of feminism, it barely scrapes the surface but it is a very good introductory text on the subject. 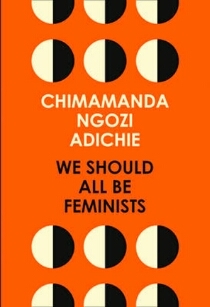 It covers pretty much all bases of gender equality from a personal perspective of Chimamanda herself, growing up in Nigeria and her experiences as a woman returning back to her roots. It is, under no circumstances, perfect. There is casual cissexism, which may turn a fair few readers away but it is so well written. She is eloquent, she is unapologetic and I definitely liked this more than Americanah! As I said, it would be a really good introductory text to someone who is wanting to understand more about feminism and why, in 2015, we still need it. It was a solid 4/5. My thoughts exactly! I have the physical copy of this book (which is adorable) and it only cost £5! But yes, it’s a perfect introduction to feminism I think. As you mentioned, it’s very basic and doesn’t get to grips with the intersectionality of feminism, but as an introduction I think it’s wonderful. It’s one of those great little texts that you could show to someone if you wanted to start explaining feminism to them, because it’s simple and expertly written. I’ve been unable to find a physical copy which is why I finally succumbed to the eBook. I don’t mind.